In August this year, it was announced that Rush star Geddy Lee would release a new book all about the bass guitar. Titled Geddy Lee’s Big Beautiful Book Of Bass, it’ll be published on December 4 via Harper Collins. The cover art had previously been held back – but it’s now been revealed, along with details of the Ultra and Luxe limited editions. The Ultra edition will be limited to just 250 copies, with each autographed by Lee. 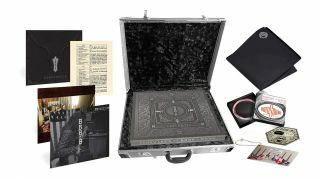 The leather-bound book comes with a silver tole briefcase, similar to a guitar case, and will include items including guitar picks, a signed photograph, a printed setlist from the R40 tour, a set of bass strings and more. The Luxe edition is limited to 900 copies and again, each has been signed by Lee and are individually numbered and will also come with some of the items featured in the Ultra edition. Check out further details in our gallery, below. Geddy Lee's Big Beautiful Book Of Bass sees the Rush vocalist and bassist explore the history of the instrument and features contributions from vintage expert Terry Foster and his Rush bandmate and guitarist Alex Lifeson. The 400-page book will also include interviews with artists including John Paul Jones, Adam Clayton, Robert Trujillo, Bill Wyman, Les Claypool and Bob Daisley. Lee says: "Its not surprising that sooner or later I'd dive down the proverbial rabbit hole into the world of vintage bass guitars." The limited edition versions of the book, as well as a t-shirt and mug, are also available from the official Rush online store.